Mini-Games – Fun little Flash games used as promotional tools for companies and organizations. Themed Africa – These are the games like Halo 2, Metal Gear and Call of Duty that use Africa as a backdrop, but not as an overriding theme for the whole game. 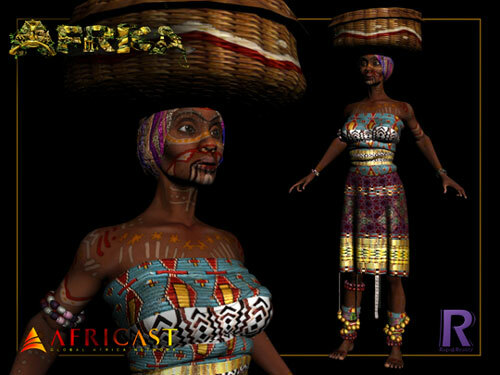 Pure African – Developed by Africans or with a complete focus on creating a totally African game. Below are some of the highlights of my research across the gaming industry, it’s not an exhaustive list. 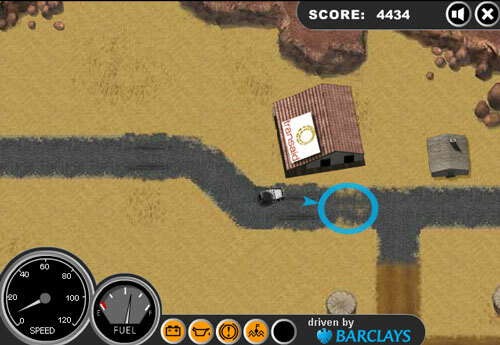 In 2006, an international aid organization called Transaid developed a fun car racing game to, “highlight the tough transport challenges faced by health workers delivering medical supplies to remote African villages.” Honestly, I was skeptical of this game at first, but it did prove to be a fun little Flash game. Someone could definitely expand on this basic idea and create a really fun web-based multi-person game. 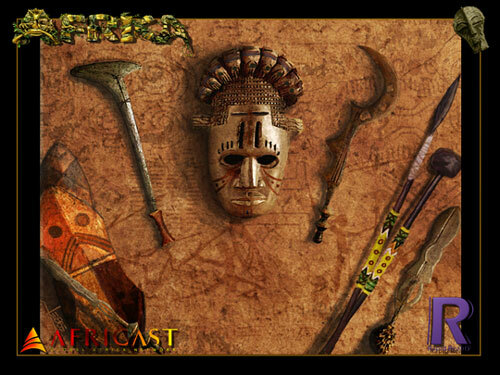 Take up your spear and set forth on an unforgettable adventure in 13th century Africa. Choose from one of the many kingdoms or found your own tribe. Protect your people and conquer your enemies, and the Griots will sing the praises of your heroic deeds. Farm the land, herd cattle, grow wealthy through trade, become a mighty warrior, master the wisdom of the ancients, or rule an empire. The choice is yours. Wildlife Tycoon: Venture Africa – Combining features of tycoon and puzzle games, Wildlife Tycoon: Venture Africa also includes a feature called “Be the Animal”, which lets you hunt, fly, or flee with any creature. Cabela’s African Safari – Hunt animals in Africa. Sword of Sygos, thought it’s being developed in Africa, actually takes place in Rome. Eyram is a passionate game developer, so I look forward to seeing their final product. 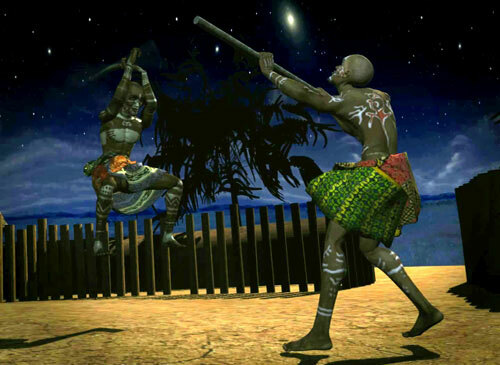 A 3D computer adventure game that takes place in a fictional African setting. Africa provides a rich, and virtually untapped, setting for gaming. This especially holds true for online gaming and mobile gaming of the future. Outside of Africa, developers like to use Africa as a theme, but they still seem to miss out on the great depth of history and adventure this continent has to offer. I’m glad to see that there is some development going on in the continent, and I hope to see a lot more in the future. Thanks for the review, I had never thought about African themed games before! Interesting stuff. Keep up the great site. This is a pleasant surprise. I never thought Africa had a gaming sector. Thanks for the post and if possible please give us periodic updates on pure African gaming. Yeah, Kenya-Byte, but this also means that others have to follow Eyram’s example and promote their work much more. And I think the inet & viral marketing such as this one does help a lot. This is a good development seeing that the mid 20s and early 30s age group in Africa was raised on 16 bit and even 8 bit Sega, Nintendo and Atari. Way before PS and Xbox even entered the gaming industries. They have come of age and a number of them are IT professionals working with code and even multimedia elements like flash, 3Ds max, et al. It took me five attempts to explain the MMORPG culture to some Kenyan brothers, but it’s good to know that the torch has been lit. That said, it’s something of a fraught idea for the developers. Firstly, there are the economic challenges. There’s not an enormous market for games in Africa at present, is the simple truth. Development of complex MMORPGs takes massive investment and server time – without a radically new development and hosting model, that won’t change. Even simpler games still require a platform of some kind. Perhaps games that work on cellphones are more viable. Secondly, there are the questions of representation. I guess this is an academic issue, really, because what sells, sells, and what doesn’t, won’t. But while we’re on the subject, what sells? 13th century Africa? A land of exotic and dangerous animals, with perhaps a few people wearing loincloths? Or alternatively, the ‘war-torn famine-stricken malarial hellhole’ that is the international community’s picture of the continent? They may have economic ‘life’, particularly for overseas markets, I’d imagine; but do we really need to develop, or play, computer games about these things which are not (I would argue) really representative of the average experience of life on the continent – or would that just be reinforcing international, and internal, Afro-pessimism? It’s a minefield for African games developers. And I don’t mean the kind in a 16×16 grid with a ‘happy face’ on top. P.S PROUD TO BE AN AFRICAN! If you’re including African developed games, do you include South Africa on that list? If so, you are missing Chase (Xbox), The Tainted (PC) as well as Toxic Bunny (PC) which were all developed by South Africans, in South Africa. In addition to the games Miktar already mentioned, I’d just like to add that South Africa has a small but growing game development industry. Both focus on slightly different elements of game development, but both are there to grow game development in the country. Drop me a line if you’re keen on finding out more about Game.Dev’s exploits! Miktar and Dislekcia, this is one of the reasons I love blogging. I figured there were some good things going on in South African gaming, but didn’t know where to look. I appreciate the links. Yes, both communities in South Africa are slightly different but has the same goals and that is to help build a local industry. I cannot elaborate on Game.Dev, what SAGameDev is about is to build a local industry, focussing more on setting online tools and building international recognition on how serious we are about game development. SAGameDev’s target is also about marketing the industry online, any news regarding games developed in Africa may use the system to get the word out. SAGameDev isnt only limited to South Africa, the rest of Africa is more than welcome to participate since beyond building a local South African industry, it would be very nice to see other African countries making waves in Game Development. There is also another local developer, Luma, working on an episodic game for Mini (http://www.mini37.co.za/). I went to check it out today, and I was bowled over by how slick and polished it is. the requirements/entry level for it? of this course/entry level,and lastly,how demandable is it in S.A? There is also some games made from Tanzania, google KASUKU GAME 1.1 and FRUIT11 GAME. You will get all of the information.